I’m so excited to share this recipe with you! It was the first I created, the inspiration to learn more about clean eating, and I’ll just be real here, my vegan, sugar free granola bars are one of the best things I’ve ever made. In fact, I planned to make this post my first on Amy Burns the Recipe Book, but refined carbs kissed with gravy are so much sexier. Do you see what I did there? 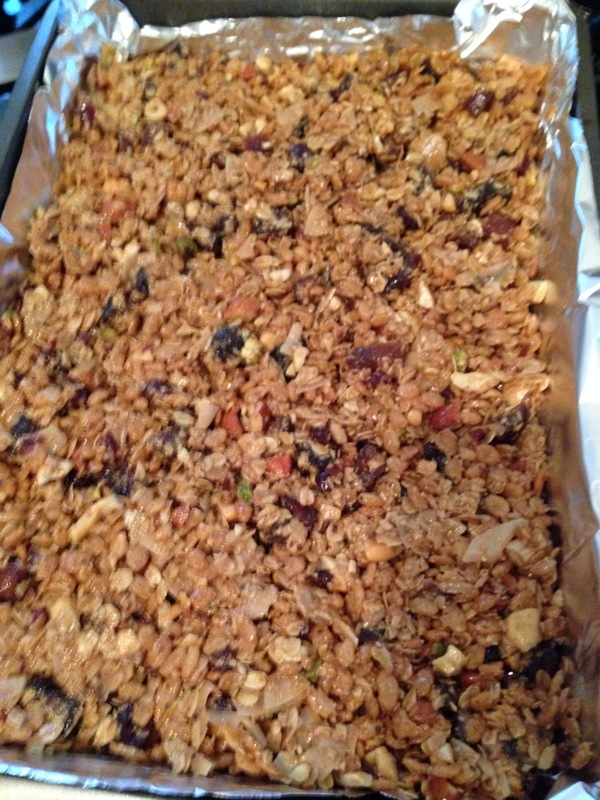 I lured you in with a carb-bomb and then dropped a healthy granola recipe on you. Keep reading, keep reading; these gems are versatile, packed with energy, and delicious! I pass them out in bars when my friends have had too much to drink, pop them in my backpack for a mid-hike snack, and make them a regular part of my breakfast routine. A few years ago, I traveled to Portland, Oregon for a ten day work conference. I travel a lot for work and my usual M.O. involves dropping my carry-on in the city’s finest Holiday Inn and plugging Whole Foods into my Google maps. I then walk or run to the nearest location (a quick trot in Detroit, obviously), and proceed to hit up the salad bar pretty heavy. It’s so hard to find healthy and consistent grub on the road, I always thank my lucky stars when there’s an oasis like Whole Foods in the middle of my Midwestern territory. So I’m walking through the Whole Foods in Portland in hot pursuit of a fresh salad and some non-perishable snacks when I stumble upon a colorful display with giant hunks of what looks like granola. For reasons inconceivable to me now, I had never eaten real granola before. 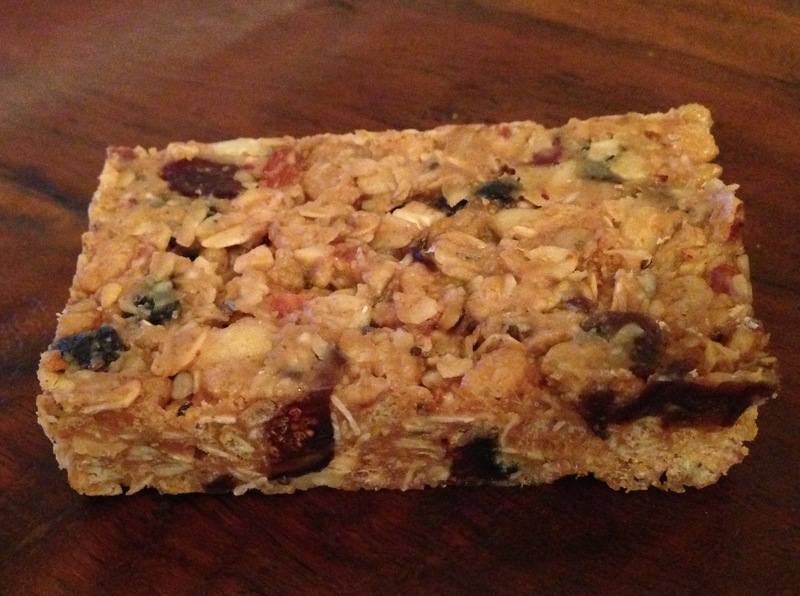 Sure I’d popped some of the cloyingly sweet, chocolaty variety in my sports bag in high school, but I had never sunk my teeth into the chewy yet crunchy texture of an unprocessed, homemade granola bar. Whole different ballgame, folks. A Michael Pollan convert and expert on In Defense of Food at this point, I diligently scanned the granola bars’ ingredient list to look for the usual culprits: artificial colors, preservatives, high fructose corn syrup, weird things I couldn’t pronounce. These babies were clean, and by God were they addictive! After more trips back and forth to Whole Foods than I care to admit, I came home and immediately began trying to re-create the recipe. While I’ve always loved to cook and had a couple of tried and true recipes down by this time, I had never tried to develop one on my own. I could follow a recipe well enough, but I never even considered the idea of writing one myself. But these bars were delicious and so I tried and I tried. And I failed and I failed; each iteration too sweet, too salty, too crumbly, too mushy. I learned quickly that these deceptively simple treats were going to be tricky to master. After dozens of attempts I came to a few conclusions which I’ll share with you here to save you the trouble of spending waaaay to much time and money trying to catch up with Whole Foods’ granola game. First: you will never have a vegan, organic, whole food granola recipe that holds together in the same way the store bought versions do. 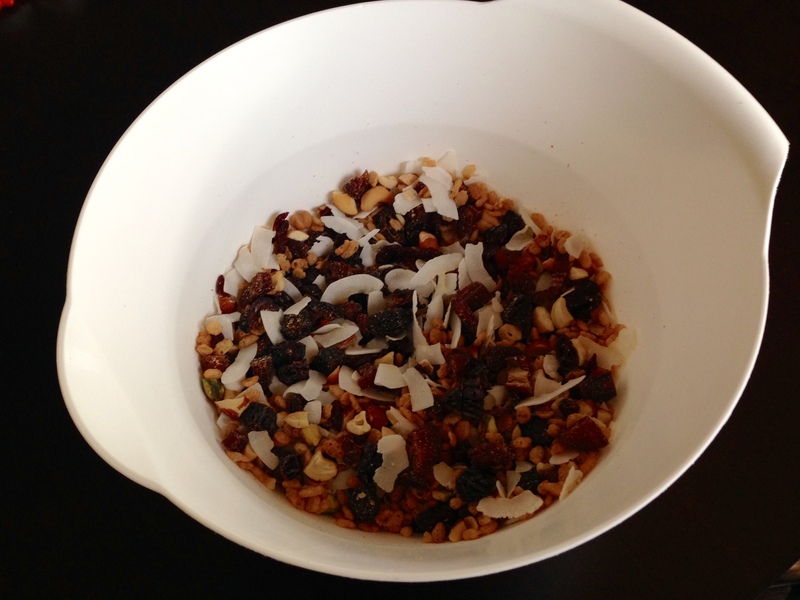 Store bought granola contains lots of lots of ingredients, including high fructose corn syrup to whip it into shape. Although it was important to me that these bars be conveniently packaged and easy to eat, it was more important that they be healthy, whole, and free of refined sugars. Once I came to terms with my granola bars being “different” than Quaker’s, I started to get creative. For instance, I accidentally made them vegan when I realized coconut oil produced a product that held together better than the butter version. Begrudgingly omitting butter from the recipe (isn’t everything supposed to be better with it?! ), I figured out pretty quickly that I needed another ingredient or technique to ensure the granola could sustain the sharp blade of a knife and be cut into bars. The fridge/freezer solved this problem for me. So yes, my granola bars should be refrigerated, not because they go bad if kept at room temperature, but because they hold their shape so much better this way. I’ve come to terms with it, and I’m going to need you to trust me on this one. Confession time: my critically acclaimed (the critics being my brutally honest family and friends) are not as good as the ones I had in Portland. Maybe it’s because I don’t have dreads like the talented chefs/aspiring songwriters at Whole Foods in Portland. Or perhaps it’s because my bars haven’t been kissed by the rarified air wafting down from Mount Rainier. Whatever! They’re pretty dern good, and I resolve to stop being tortured by the Portland version I’ve surely built up in my mind. “Where they really that good?” I sometimes wonder. As I mentioned, this recipe couldn’t be more versatile. Throw in whatever kinds of fruits and nuts get you excited. And once they’ve set up in the fridge, you can cut the granola into bars and eat them plain, dunk them into some thick Greek yogurt, or crumble them up and pour over some ice cold milk. Just make the recipe and see where your creativity takes you, my friends. One thing’s for sure, these sweet yet sustaining bars will become your favorite way to start the day! Preheat oven to 350 degrees. 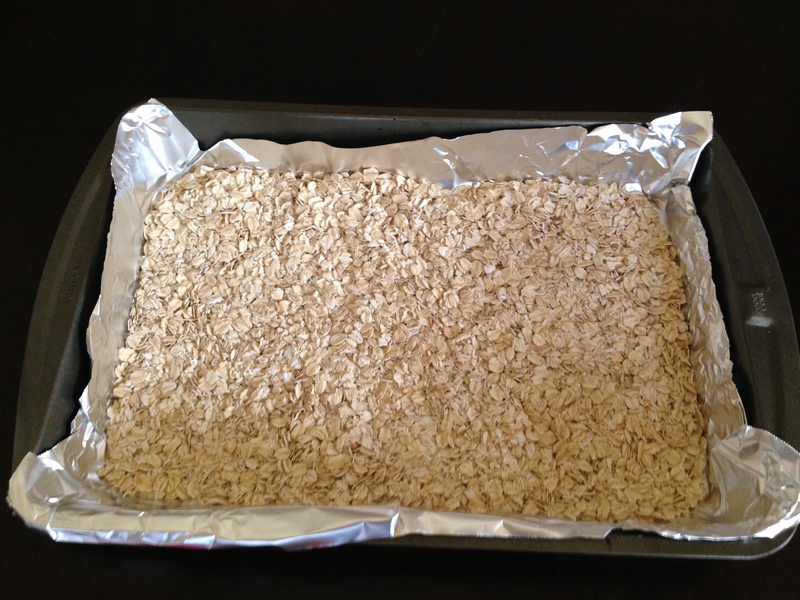 Line a 9 x 13 pan with foil and pour oats (and nuts if unroasted) into the pan. Bake for 20 minutes, stirring the mixture half way through. Chop fruit and nuts into ¼ inch pieces and combine with brown rice crisps and coconut in a large mixing bowl. 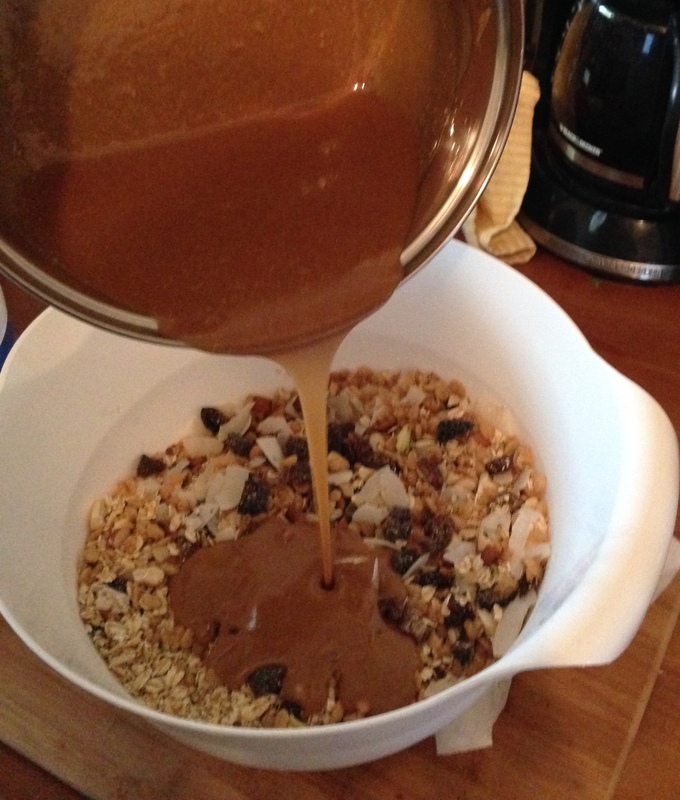 Pour the toasted oats into the bowl and mix to distribute ingredients evenly. In a medium saucepan combine peanut butter, coconut oil, vanilla, pumpkin pie spice, honey, maple syrup, and salt over medium-low heat. Whisk continuously until the peanut butter and coconut oil melt and the mixture becomes homogenous. Once it’s all combined, take off the heat and pour over the dry ingredients. Stir the liquid mixture into the dry ingredients until the sticky mixture evenly coats the oats, fruits, and nuts. Transfer the contents of the bowl to the 9 x 13 pan and press evenly until compact. I like to cover the granola with a piece of parchment at this point and then take another pan of the same size and press it on top of the one with the granola to get an even bar. Cover and refrigerate for 3 hours, or if you’re in a hurry and dying to get one of these in your mouth ASAP, place the pan in the freezer for 30-45 minutes. Lift the foil you lined the pan with to remove the granola bars. 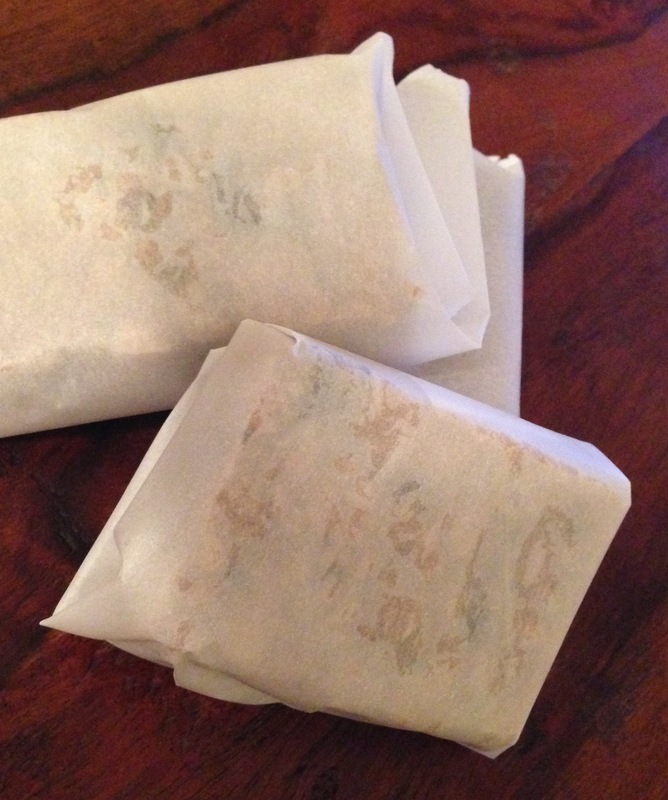 Cut into 16 even pieces and wrap individually with parchment paper or foil.